Traveling south out of Santiago de Compestela we decided to tack on another country and swing through Portugal on our way back to Madrid. While less scenic than the North coast, the five-hour drive along the western seaboard of the Iberian Peninsula was blissful. 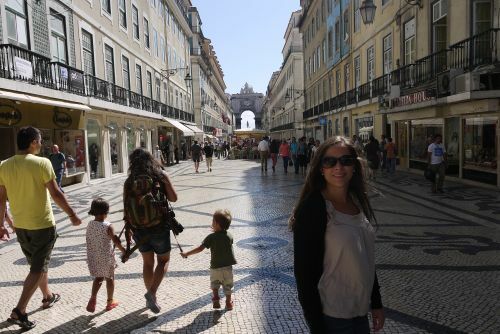 Arriving in Lisbon, the capital of Portugal, we quickly navigated our way to the hotel and luckily found some street parking nearby. Already late in the evening and exhausted from the drive we decided to call it a night and get an early start the next morning. The next morning we trekked it into the city. Determined to find some brunch we walked through the streets in the two main sections of the city, Barrio Alto and Baixa, before finally stumbling on a fantastic little café. Two tasty salads and a rather tart mango juice later we decided to head toward the nearest tramline. 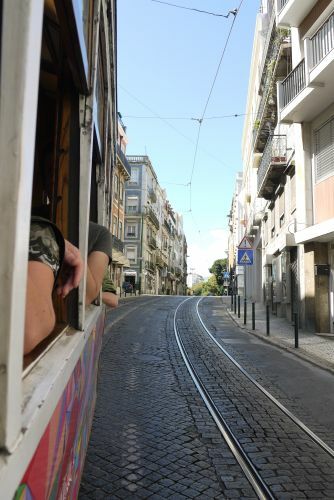 Once running all around Lisbon, the city today only has three of these tram lines still in operation. 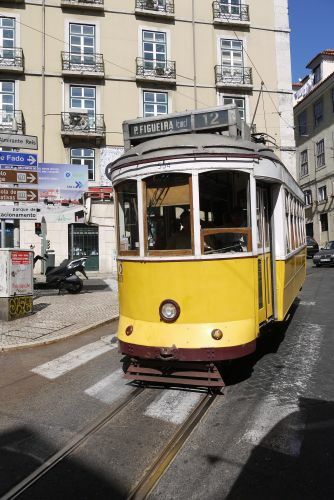 These three lines sport antique trolley cars that Portugal imported from the US in the early 1930s and 1940s. The #28 line goes through most of “old town”, the historic area of the city and taking one of these local old-timey San Francisco-esque above ground trams is the best way to experience the city and take in the sights. A bit full from lunch, we found our way onto the next tram, plopped down on one of the wooden bench seats and spent the next hour or so with our heads and camera outside the window taking it all in. The “antique-ness” of the trams couldn’t go unnoticed. The tram cars are now 70 to 80 years old and with their all wood construction, the joints had certainly loosed up a bit over time. 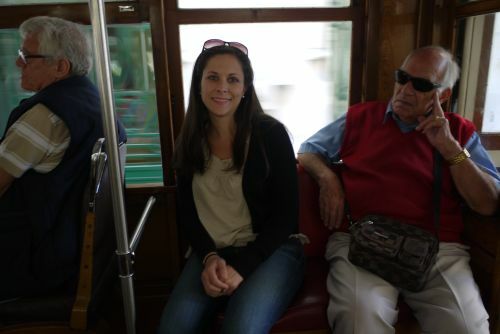 Needless to say, the stop and go motion of the tram went hand-in-hand with a gentle sway of the entire tramcar. 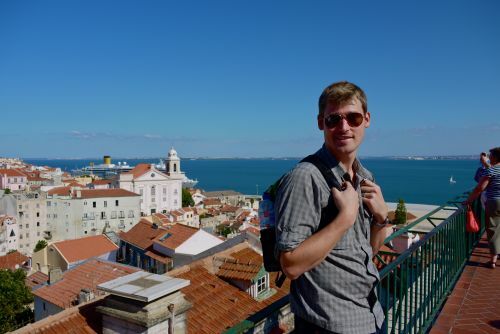 Somewhere along the line a massive pack of tourists decided to jump on our trolley and after our noses where scrunched up next to some ripe underarms we jumped ship and decided to walk the rest of the way to our next stop – St. George’s Castle (Castelo de São Jorge). 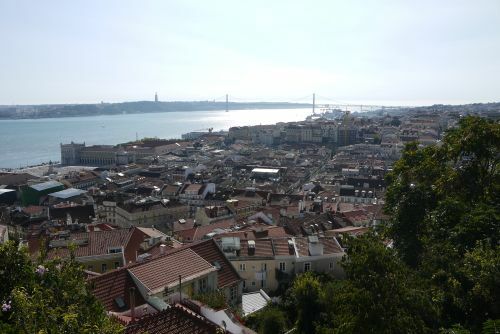 St. George’s Castle sits on the hilltop of the highest hill in the historic Lisbon city center. While the site dates back to the 6th century B.C. and is a Moorish castle by design, it was most notably the royal palace of the Kingdom of Portugal in the early middle ages. 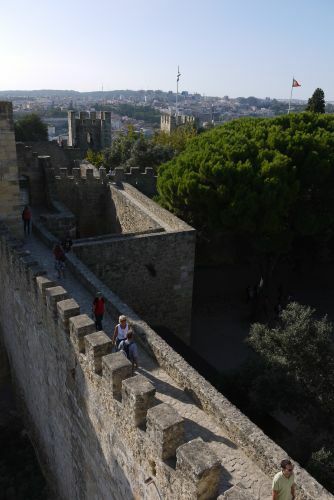 Perched atop the highest vantage point in the entire city, the view from the Castle walls is the most special attraction the complex has to offer. 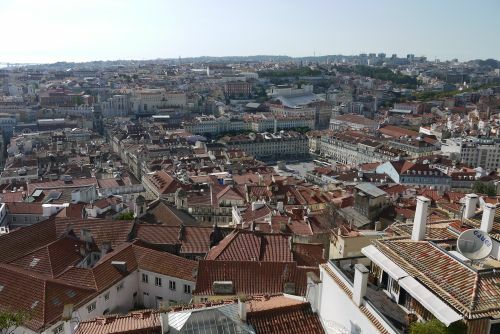 Atop any one of its many towers offers amazing vistas of the entire city from every angle you could imagine. 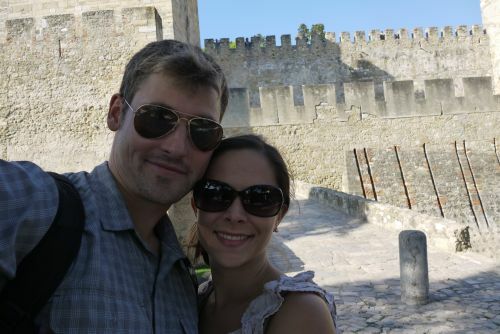 However, since the walls and towers are pretty much all that remain of the castle complex, after we had our fill of beautiful city scenery we decided to move on with our city tour. 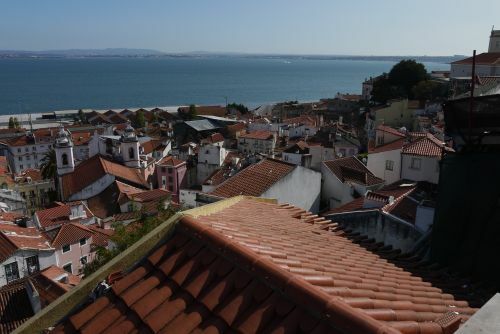 Walking down the hill away from St. George’s Castle and through the Alfama district we stumbled on a small church offering fantastic views of the area around the port. 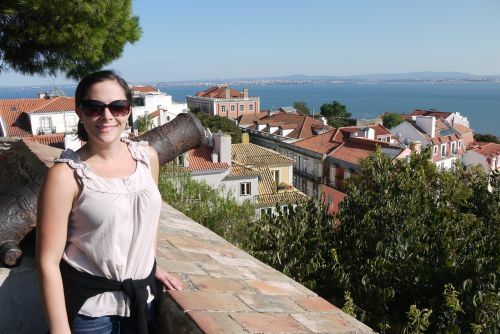 While there is much more to see and do in Lisbon our 24-hour time constraint certainly didn’t offer us enough time to see and do all we had hoped. None the less it was a great stop and well worth the extra hours in the car. The next morning we again mounted our trusted Panda and made the 6-hour trek back toward Madrid. That night we stopped in Toledo – a short 30 min drive outside of Madrid. We strategically booked an apartment complete with washing machine for the evening and immediately got to work on doing some laundry when we arrived. The next morning we drove into Madrid to exchange our trusty Fiat Panda for another rental car for our next road trip through the Andalusia and the south of Spain. Was your panda and automatic or manual transmission? Do most people drive stick in those little european cars? Manual all the way my man. The only problem is the engine size – its kinda strange climbing hills on the highway in 2nd gear!